Spacious studio apartment close to the centre of Brighton. 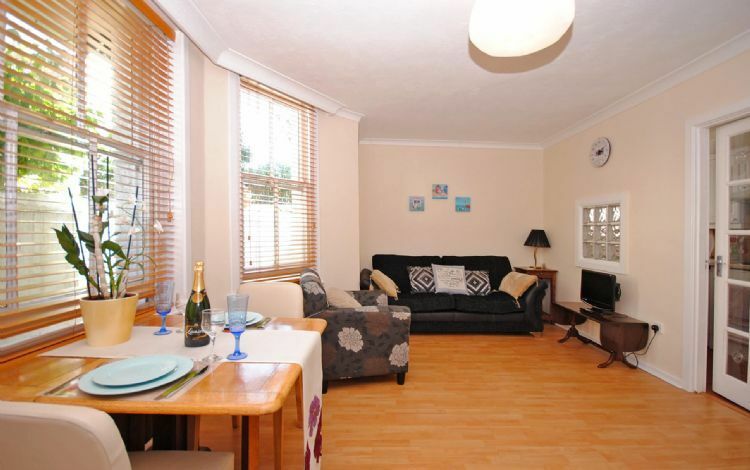 "Stonesthrow" is a spacious studio apartment close to the centre of the exciting city of Brighton. Just a short walk from the beach, as well as the shops, bars and restaurants of Brighton and Hove, the apartment is in a great location for anyone wishing to explore all this popular city has to offer. The apartment is on the lower ground floor of the building with a shared entrance hall. There is an open plan studio style living room with bed area, which includes a sofa and arm chair, TV with DVD player and a dining table with chairs. The sofa is a double sofabed and so can be used to sleep 2 extra guests. A travel cot is also available for young children. On the other side of the room there is a double bed with a curtain that can be pulled over to seperate off the bed from the rest of the room. There is a seperate kitchen which includes a fridge, freezer, cooker with hob and all the kitchen equipment guests should need to be able to comfortably self-cater. (Please note, the washing machine shown in the photograph of the kitchen has been replaced with a freezer). There is also a good sized bathroom which has a shower over the bath, a wash basin and a toilet. Just a short walk to the end of the road and you will find yourself on the seafront, which has a long promenade (famous for its colourful beach huts) running along the length of Brighton and Hove beach, all the way to Hove Lagoon. At the other end of the road is the high street with a selection of restaurants and cafes to choose from. Hove railway station is also less than a mile from the apartment. The studio is ideally located in walking distance from the beach, shops, bars, and restaurants. Checking in and out was very flexible and communication with the owners easy. The studio, kitchen, and bathroom were clean and in good state. There's a bed that fits two and a sofa that could fit another two. With the sofa pulled out, there isn't much room left, so it would have to be folded back every morning when four people want to move around and use the dining table. The sofa is comfortable to sleep on. All in all, a very nice place to stay! Ich würde ja gerne die gebuchte Ferienwohnung in Brighton bewerten. Leider konnten wir diese aber nicht beziehen. Einige Tage vor dem Beginn unseres Aufenthalts erhielten wir eine Mail, dass die Wohnung wegen eines Schadens nicht bewohnbar sei und es wurde uns ein anderes Objekt in einem ganz andern Ort angeboten, sehr auf dem Land und schlecht erreichbar. Da wir ohne Auto unterwegs waren, konnten wir dieses Angebot nicht annehmen. Schliesslich wurde uns eine andere Wohnung in Brighton angeboten. Es handelte sich dabei um die Wohnung der Mutter der Vermieterin. Die ganze Zeit über hörten wir nichts von der Vermieterin, sie kümmerte sich um gar nichts und wir haben sie nie zu Gesicht bekommen. So etwas haben wir nie vorher erlebt. Vor unserer Abreise versuchten wir ca. 5x, sie per Telefon und SMS zu kontaktieren, keine Antwort. Schliesslich reisten wir ab und warfen die Schlüssel in den Briefkasten. Die Auskunft, dass die Wohnung nicht bewohnbar sei, war ausserdem eine Lüge, wir sahen deutlich ein Ehepaar in der Wohnung beim Frühstück! Walk along the seafront or high street and you will soon be in the centre of Brighton, famous for its pier, Royal Pavilion, a great selection of unique shops and its nightlife. The choice of bars, cafes, restaurants and shops is enough to cater for all tastes, but do look out for some special ones, such as "Choccywoccydoodah"... a must for any chocolate lover! Brighton's Royal Pavilion is a must see attraction. It is the spectacular seaside palace built by the Prince Regent (George IV) and now houses works of art and furnishings of the highest quality. Brighton Pier is also a very popular attraction, great for anyone that likes the fairground or strolling along with a bag of fish and chips for lunch. Brighton also has a wide range of annual events which, among others, include Gay Pride, a food and drink fair, the London to Brighton bike ride, and the air show at nearby Shoreham. From Hove railway station, you can be in London in just over an hour, making it great for a day trip to see the site of the capital. There are also excellent bus services locally, running along the coast, so exploring the area without a car can easily be done.